November is National Adoption Month, so I asked friends of mine to share their adoption story. We met them earlier this year, just after they adopted their daughter. 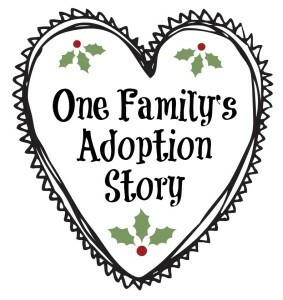 This is a topic close to my heart, as we know quite a few families who have either adopted or are seeking to adopt. We knew we would have difficulty conceiving children, but chose to walk this path together as husband and wife. It eventually led us to our daughter, and she was well worth the wait. After marrying, we began to see a reproductive specialist who diagnosed and began treating our condition. This process was not without its crosses. Initially, the specialists attempted to leverage uncertainty as a means of hopefully having us concede to IVF. We refused. The specialist also encouraged multiple conceptions within my body as a strategy of ensuring that at least one child would be selected and the others would be killed. Again, we declined to proceed with this approach as we refused the idea of reducing a multiple pregnancy. Instead, we tried to conceive only one or two children at one time but it was unsuccessful. Although we were always at peace with the idea of adopting, as we reached this chasm in our treatment, we knew that we were called to put more of our efforts into adoption. The process started in Vancouver in 2009 and finished at our new home in Victoria earlier this year. It took about 3 years to complete (mostly due to our move). We did a 10-week adoption preparation course in Victoria. Then we started our home study (seven visits from a social worker), which we signed on Easter and nine months later, we got the call about our daughter. It was our Christmas gift from God. We will never forget how our lives changed when we finally received the phone call from our social worker. She had a child for us, but we were to consider this massive decision carefully. After a few days, we made our decision without seeing a single picture. We said YES. The day we received our first photo of our daughter was like love at first sight. The anticipation of meeting her began to build until finally the day arrived. It has been 10 months now since our placement day and we have happily settled into being a family, filled with the ups and downs that life can bring. There were lots of firsts for us this year: Valentine’s Day, summer vacation, Easter, our daughter’s baptism, Mother’s Day, Father’s Day, first day back to school, Thanksgiving, Halloween, family birthdays. We are all excited about a very special first together soon, that of the birth of The One at the center of our lives, our Lord Jesus Christ, King of our household, King of our lives. He is the glue that keeps us together so that we can bring Him to others through our family life. We truly thank God for the gift of adoption and we highly recommend it. We can’t wait to have a brother or sister for our daughter when God wills it. The proud parents of an amazing child of God. Thanks for sharing this story Bonnie and for suggesting I look it up… so beautiful to read a positive adoption story! So many firsts to look forward to! Glad it can inspire you! Their story makes me happy to. I wish you all the best in your adoption journey! What an amazing story. I have several family members who have adopted and it brings back memories when they first told us. Congrats on your little girl! A friend of mine adopted her little one. Such a long process but so glad it all worked out! One of my best friend’s adopted all three of her children. There are so many children out there that needs good homes. Congrats on your little girl. What an amazing post! I’m glad your story has a happy ending! Thank you for such an uplifting story of faith and hope. Beautiful!